Punarnava Charitable Trust is wholly focused on improving the health, education and welfare of poverty struck villages on the outskirts of Coimbatore in Tamilnadu, South India, highlighting, amongst so many pressing demands, the need to feed the neglected elderly and provide a monthly free medical health camp. Punarnava is a charity trust based in Coimbatore in South India. They run a completely transparent operation with the philosophy that everyone can make a positive contribution to the world, no matter how humble or not your back ground is. They are focussed on supporting 5-10 villages in the Thirumalayampalayam panchayat. These villages suffer from extreme poverty, social problems with neglected elderly and children being raised in negative environments. Building a kitchen for a children's home to house 30 orphans or children of struggling single parents from the poverty struck areas.They aim to identify those children in the most negative environments e.g. with alcoholic abusive fathers, or exploited widows and place them in a positive, nurturing environment teaching higher spiritual and moral values.The children's home is already built but until the kitchen is ready they cannot take in any children. Relief of sickness. Every month they provide a free medical camp to ill villagers for whom this is the only access to medical care. The difference they make to the quality of life of the sick and diseased is inestimable. Diabetes, infectious diseases, blindness, strokes, arthritis are just some of the prevailing issues. 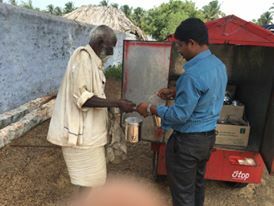 Feeding 100 elderly neglected villagers daily. With increased urbanisation many elderly are left to fend for themselves with no family to take care of them. Many of them are blind, disabled or immobile. All of them are malnourished and painfully thin. They are too frail to work and would slowly starve to death if it wasn't for the wholesome, fresh, hot meal Punarnava delivers to them daily. Toilets are being built in the villages to increase hygiene and stop open defecation in the fields. But they now need a water supply to use these toilets. Punarnava aims to make water sources available through various means including building wells and harvesting rain water effectively. Careful due diligence was done by an OKA associate (see below for further details) who visited them. The incredible thing about their work is the minimal costs. There are no administrative costs at all as it is run by dedicated volunteers. Similarly the logistics, doctor's fees, identification process for eligibility is all free. This means that all the money donated goes directly to those that suffer most with no wasteful and unnecessary administrative costs. 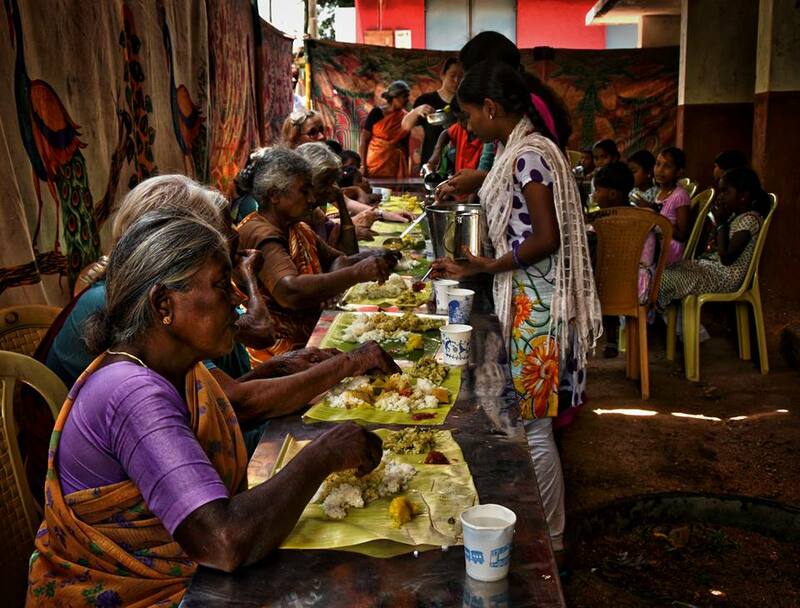 In March 2016, I visited Punarnava charity to understand their daily process of feeding the neglected elderly of several villages in Tamil Nadu, South India. They also hold a monthly free medical health camp treating and feeding hundreds of poverty struck villagers. The philosophy of Punarnava is 'maitreya' or friendship and 'karuna' or compassion. They believe we should create abundance in whatever form possible for everyone around us. Greed, a strong sense of ownership, and making life only about yourself are seen as unethical and egotistical. People should be instruments of a larger, positive purpose. When I arrived, I met Geetha, a remarkable lady who has dedicated her life to administering the charity. She works purely on a voluntary basis, simply for the love of making the world a better place. She introduced me to the other volunteers: Suresh and Somu, both articulate, driven, young men who oversee the logistics, delivery and problem solving of the drive to feed the elderly and the medical camp. Every morning fresh vegetables, rice and dal are cooked by two village women. These women often have alcoholic husbands who beat them and gamble their money away. The initiative supports them to earn a safe, independent income. The meals are packed into tiffins and loaded onto a jeep. The jeep makes 5 stops in the centre of each village where the elderly eagerly await the day's hot meal. A hundred meals a day are delivered. There is a comprehensive selection process for eligibility. Those elderly who do not have regular access to food or any relatives to support them are considered. Disabled villagers are also fed as are widows with young children. I spoke to several villagers seeking to understand how they became victims of circumstances. Maraal is a softly spoken woman in her eighties. It is obvious she must have been stunningly beautiful in her youth. She lives next door to her alcoholic son and daughter in law and is only allowed to eat the leftovers they throw out. On the days there are no leftovers, she goes hungry. She has a 1000 watt smile when I ask her if she enjoys her regular tiffin. Bagyam is a widow who doesn't remember how old she is. Her son and daughter in law died in an accident and she was left to raise her grandson. She spends the day herding her seven goats but it is not enough to feed her. Munni and Kanamma are an elderly couple in their 80s. They have one daughter who is married. The daughter is not allowed to visit or support her parents, expected instead to sacrifice her life for the in laws, husband and children. They are too frail to work and depend on Punarnava for the only meal they get. Arunchamy is paralysed and his wife Ramathal takes full time care of him to the best of her ability. He has improved with treatment from the free monthly medical camp but still does not have use of his arms. They would have starved if it wasn't for the regular tiffin delivery. There were stories of alcoholism, domestic violence, accidents, disease, social problems and gambling breaking up families. The eventual victims are often the elderly who traditionally rely upon their sons to care for them in their twilight years. These elderly have nothing: no earnings, no hope, poor health, no family, no youthfulness on their side. They are without exception painfully thin and malnourished. There was a palpable sense of insecurity and fear. Time and again we were asked "will you feed us till we die?" I asked one man what the worst and best part of his day was. He said waking up with gnawing hunger in the middle of the night was the worst. The best part was the hour before the tiffin was delivered. He always arrived over an hour early to wait in the hot sun as the anticipation of food made his "heart soar with happiness". Another lady said her grandchildren would sometimes come and pick at her food. Although it meant less for her, it gave her great happiness to have the social interaction and time with them. It was frustrating to hear of problems the volunteers sometimes face. In one village the corrupt local councillor insisted the tiffins be given to him. It was obvious he planned to feed his cronies, friends and family. Somu refused and was threatened with violence. When Somu stood his ground despite the argument escalating and turning nasty, the councillor threatened the villagers. He said any villager who collected their tiffin would have their pension stopped. For several days the villagers were too frightened to take their food and went hungry. It was only when Somu threatened to go to the newspapers and file an official complaint with the political party's headquarters that the issue was resolved. However, having a resentful bureaucrat remains a thorn in their side. The incredible thing about this whole operation is the minimal costs. There are only four costs: the salary of the village women who cook, provisions (rice, lentils, vegetables, spices etc), petrol and cooking gas. The office, jeep, kitchen use, administration, driver and logistics are all free. It is clear that every penny donated goes directly to where it is needed with no wasteful administrative costs. Punarnava is doing wonderful work that is not supported by any large organisations and is in keeping with OKA's ethos of living and giving with minimal costs. Trust this mail finds everyone at One kind Act in good health and in great spirits. We are thankful for your kind support and pray that onekindact and each one of you go from strength to strength. Our meal program is going on very well. I personally go to meet the beneficiaries of the program periodically, and find that they are very happy to get the hot meal at noon and bless every one for this gift. In my recent visit to the village last week, I was pained to see some of the old people suffering with pain in the limbs due to old age and arthritis. We are taking remedial measures of going on motorcycle to all the remote villages with a doctor to provide the much needed Ayurveda care. Given below is the link for the facebook page on ANNAM- God's gift where we post the meal provided for the day. Also attaching herewith some latest pictures for your kind reference.